While we haven't actually had any snow here yet, it definitely feels cold enough today. Which means another day of playing indoors. So I thought it would be a good day to try out Snow Dough or Clean Dough. I found this recipe in one of my favorite books First Art: Art Experiences For Toddlers and Two's By MaryAnn F. Kohl. Mary Ann Kohl has many great books about making art with kids and if you are looking for a book of fun activities to do with young kids (and sometimes even older kids) I highly recommend checking her out! 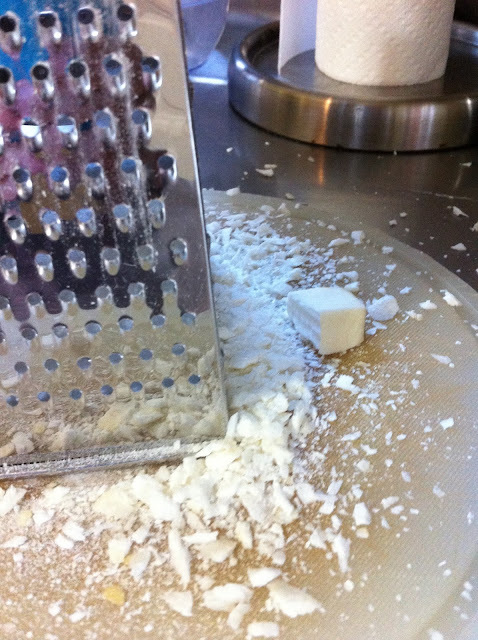 To make the snow dough you need 1 bar of ivory soap (grated with a box grater) 1/3 cup of borax, 2 rolls of toilet paper and enough warm water to mix it all together. We started by unrolling the toilet paper into a large plastic tub. The look on The Bean's face when I handed her an entire roll of toilet paper and told her to unroll it was priceless! Needless to say the girls loved this part. 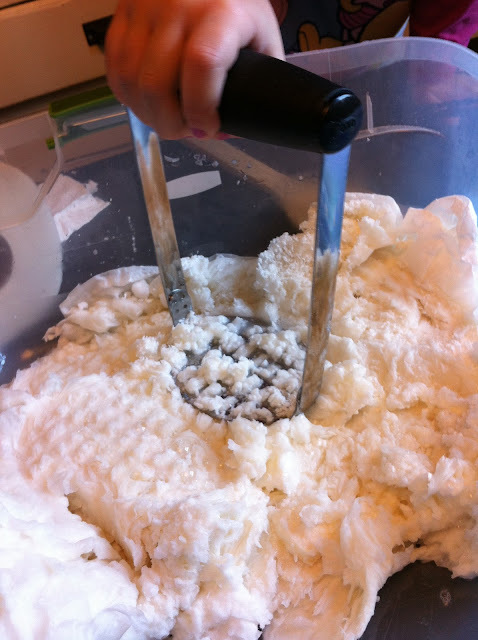 After they had unrolled all the paper into the tub we added the grated soap and the borax. I then slowly poured in warm water a little at a time. I gave the girls some wooden spoons and a potato masher to mix up the mixture. 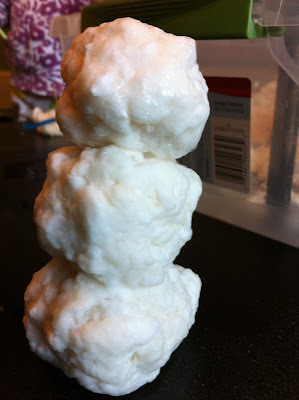 Once it was all mixed together it really has the consistency of snow (or paper pulp), which is why we started calling it snow dough. The soap made it smell good too. You can press it together to form shapes, smush it or stick stuff into it. 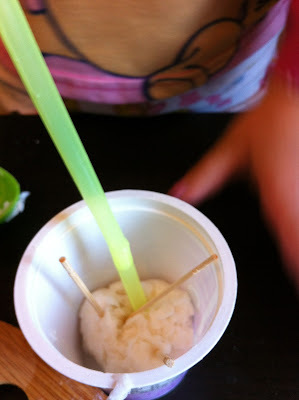 I gave the girls some plastic spoons, plastic cups and bowl, straws and a few toothpicks. They had a great time making pretend ice cream, a birthday cake and we even made a few snowman. After they were finished, I took the dough and put it into a Ziploc bag, According to the directions it is good for a few days if kept in an airtight container. If it starts to dry out you can just add a little more water to rejuvenate it. aw I remember making this with my two last year-they loved it and it smells lush too!